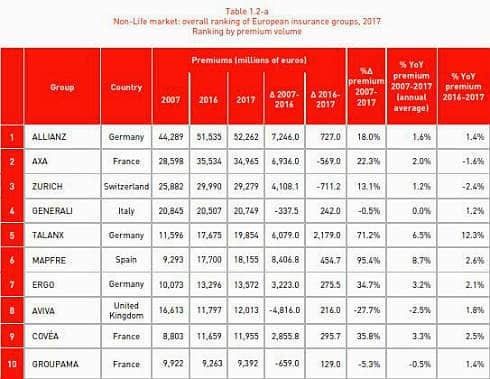 MAPFRE is among the 10 main insurance companies in Europe, according to the 2017 edition of the annual ranking prepared by MAPFRE’s Economic Research and published recently by Fundación MAPFRE. Last year, MAPFRE was in eleventh place, behind the Dutch company Aegon, but it has climbed this year’s ranking. 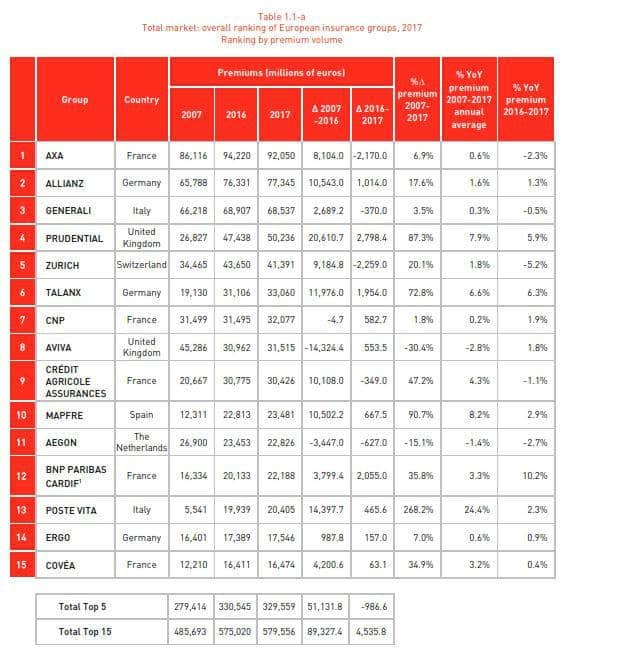 AXA still leads the list with 92.05 billion euros in premium volume in 2017, down by 2.3 percent. The 15 largest European insurance groups issued 579.6 billion euros in premiums, up 0.8 percent on the previous year. Two important events affected the performance of the business: low interest rates remain unchanged, which will continue to hinder the development of the Life savings business and traditional life annuities, as well as return on investment, and the extreme catastrophic events in different regions that have impacted negatively on Non-Life income statements. 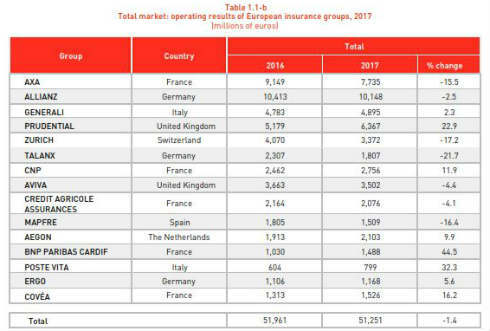 Aggregate operating results of the insurance groups included in the ranking dropped by 1.4 percent in 2017 to 51.3 billion euros, greatly affected by higher than normal catastrophic losses. In the Non-Life segment, the report from the Economic Research area shows a 1.7 percent increase in premiums for the 15 leading companies, to 255.4 billion euros. Once again, the German company Allianz tops the ranking in the Non-Life segment, with premium volume of 52.26 billion euros.